Jeff Quinn is the director of community alignment for Family Connects International, a program connecting families to community resources via nurse home visits. Quinn builds collaborations with non-profit and other agencies that provide services to parents and children, linking them to the nursing teams. Quinn also serves as the co-chair of the Durham Connects Community Advisory Board. 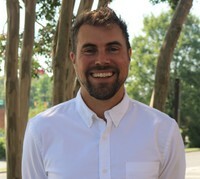 Previously, Quinn served as director of community resources with Durham Connects and coordinated a number of projects at the Center for Child and Family Policy. Quinn has also done a lot of research in the realm of fatherhood and fathers' unique impacts on child development. Quinn received his undergraduate degree from Drury University in Springfield, Missouri, in May 2001, and in May 2010 he received his master's degree in public health from The Gillings School of Global Public Health at the University of North Carolina at Chapel Hill, where he focused his studies on health behavior and health education.